This design was originally created for a special little girl and we are happy to offer it to all our customers. Choose your birthday candle number and enter a name or nickname for the banner. 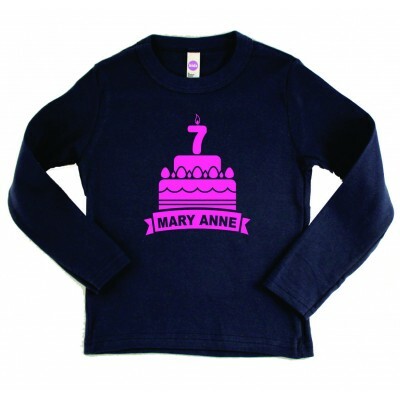 We can also write Happy Birthday or any custom message on the sleeve (available on long sleeved shirts only) for a truly one of a kind gift. Please note that our long sleeve shirts, raglan sweatshirts and tank tops run small and order a size up for a proper fit. Other styles run true to size. Our design colors are below. The pink, purple, and silver shimmer are smooth to the touch. The glitter colors have a sandy texture and a brilliance that elevates all our designs to spectacular! The glitter will not rub off on hands or furniture. Note: Be sure to verify that all spelling and options are accurate before placing your order. Personalized items will be customized based on supplied information and cannot be returned if incorrectly ordered. Would you like us to gift wrap your order? You may select this service on the Shopping Cart page during the checkout process. Join our newsletter to receive exciting announcements and special offers!